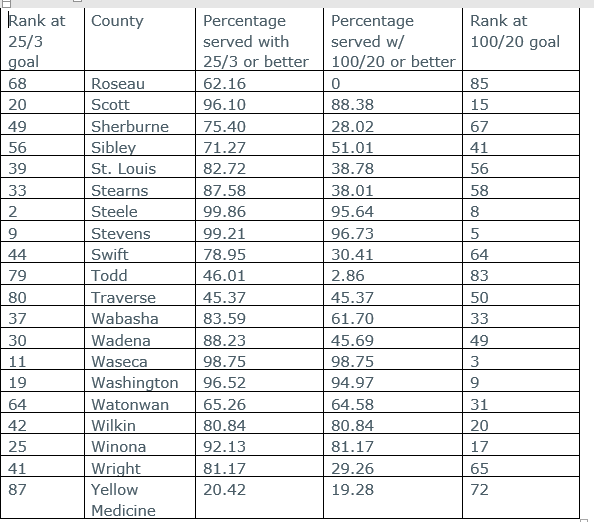 In 2010, Wilkin County was listed by the FCC as one of the least served counties in Minnesota. In 2014, 67 percent of Watonwan County had access to broadband. (Broadband was defined with lower speeds back then.) Today 81 percent of the county has access to broadband speeds of 25/3 (Mbps down/up) and 81 percent has access to the 2026 speed goals of 100/20. In 2011, MN2020 created a video on the importance of broadband in Wilkin County. The same video could be made in other communities today. In seven years they have gone from one of the worst to number 20 for 2026 goals. They just need to find a way to extend the existing network(s). There are several providers in the area who provide service at 2026 goal speeds: Midcontinent, Red River Communications, Runestone Telephone, 702 Communications, and Wolvertone Telephone. Wilkin County is also in line to receive $47,246 in CAF 2 funding to upgrade 71 locations. CAF 2 recipients are only required to upgrade to 10/1 access. Many may choose to upgrade to better speeds but there are no requirements. DDI score of 39.47 out of 100.